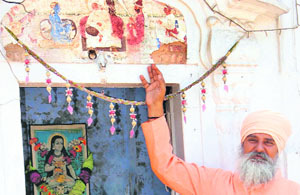 Amritsar, Punjab: Call it the ignorant attitude of the caretakers or the authorities concerned, the rare fresco adorned on the ‘samadh’, located just opposite to the Golden Temple’s main entrance, is on the verge of vanishing. “This is the rarest wall painting I have ever seen. It has a rare picture of Guru Nanak Dev along with his two disciples- Bala and Mardana, playing ‘Rabab’ besides his two sons- Sri Chand and Laxmi Chand,” said Rajneesh Khosla, a heritage lover and collector and preserver of centuries-old rare manuscripts. The beautiful fresco suffered further damage allegedly due to the ongoing construction work of the entrance plaza. The ‘samadh’ is located just near the newly constructed temporary ‘Jora Ghar’ and opposite the Shani Temple. The ‘samadh’ belonged to Mahant Tehal Dass Akhara, one of the 12 akharas situated around the Darbar Sahib. Khosla said the handmade fresco had been made with natural colours, but unfortunately the careless attitude of the authorities concerned had done extensive damage to it. Head of the akhara Mahant Nihal Dass said the foundation of the akhara was laid by Baba Sri Chand, the elder son of Guru Nanak Dev. He claimed that similar frescos were present inside the dome of ‘samadh’. However, with the passage of time, they got destroyed. “We are ready for conservation of this rarest fresco and willing to spend money on it. But we don’t know how to preserve it,” said Mahant Nihal Dass, while adding that he would welcome the suggestions from the experts. The sole wall painting was likely to face extinction if no concrete steps were taken to preserve it by the administration or the authorities concerned, said Khosla, while seeking the intervention of the district administration in the matter. Deputy Commissioner Rajat Agarwal said he would have to check with the Department of Tourism and Culture, which has already identified a number of such heritage structures for conservation. He said he would ask the department to see what could be done in this regard. Further, if the akhara head wanted to conserve it, they could also directly contact the department of tourism in this connection, added Agarwal.